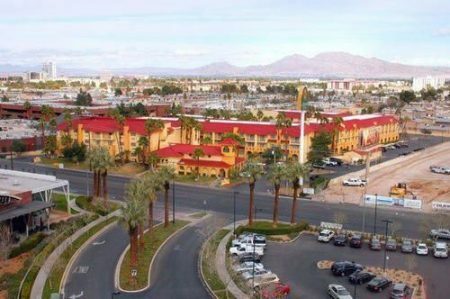 La Quinta Inn & Suites Las Vegas Airport North Convention, 3970 Paradise Road, is a business focused hotel situated a short drive from the Las Vegas Convention Center. 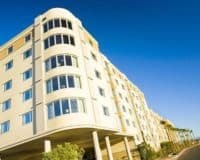 La Quinta Inn & Suites Las Vegas Airport North Convention, is a business focused hotel situated a short drive from the Las Vegas Convention Center. 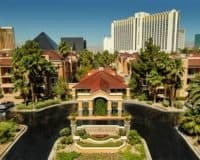 Its combination of excellent facilities, friendly staff, and a good location makes it an ideal spot for anyone who wants to have a productive Vegas stay, while also being comfortable at the same time. The amenities that the hotel offers are simple and functional and include a refreshing outdoor pool, perfect to use during the hot Vegas summers, a fitness room where you can maintain your usual regime or blow off some holiday steam. While business customers will appreciate the modern business center, which features printing and photocopying facilities, ensuring that you can make the most out of your stay. This comes alongside all the usual amenities that you would expect, including easily accessible WIFI, a launderette, and free onsite parking. With the hotel also providing a free continental breakfast for those that want to start their day in the right way. The accommodation is spacious and comfortable, with each of the air-conditioned rooms, providing flat-screen televisions, equipped with cable: the perfect way to relax after a busy Vegas day; a mini-fridge alongside, coffee and tea making facilities. While also offering the usual things, such as soft beds and clean bathrooms. La Quinta Inn & Suites, is at the higher end of cheaper Vegas accommodation, providing a good range of amenities and comfortable rooms. This makes it ideal for anyone who wants to have a cost-effective Vegas stay, which won’t break the bank. However, the hotel is especially good for business clients and offers a good range of services that cater to your every, business need. Within 1 mi (2 km) of National Atomic Testing Museum, Las Vegas Convention Center, and University of Nevada-Las Vegas. Within 2 mi (3 km) of the Thomas and Mack Center and Fashion Show Mall.